The WALKSacramento Team has been following the results of the National Housing Travel Survey, the anatomy of a bike lane movement, road pricing and taking quizzes about scoters vs. bikes. Check out what we have been reading this week. This article takes a look at the National Household Travel Survey that examines long term travel trends. Data is collected every five years giving it a long range perspective of how people travel. Some key points from the data is that commute times are at an all-time high, contrary to the belief that due to freeway systems, commutes are more convenient. This data casts doubt over that concept with the average American spending 78.9 minutes in their car in 2017. Additionally, the number of people taking public transit slightly rose from 2001 and vehicle ownership decreased by an even smaller margin. Overall, the data shows very little change in travel trends in the last decade but the article breaks down key travel trends that give some perspective in our daily travel choices. Read more about travel trends here. This article offers a comprehensive analysis of the realities of active transportation advocacy and the sustained work it takes to achieve change in the community. The article draws the curtain on the political processes, community outreach and organizing. This was a two-year process that maintained momentum and persisted in creating a protected bike on Valencia Street in San Francisco. The article offers insightful perspective into what it takes to advocate for active transportation infrastructure. Read more about this effort here. This timely article deconstructs the argument against road pricing, the cry that pricing highways during peak congestion times is inequitable. With a comprehensive list the article highlights the realities of how the current transportation finance system in place is already inequitable. From breaking down how free parking benefits only the higher incomes with a readier access to a car to slowing down public transit the article exposes the reality that people without vehicle access already shoulder the burden of an inequitable transportation finance system. Read more about this debate here. 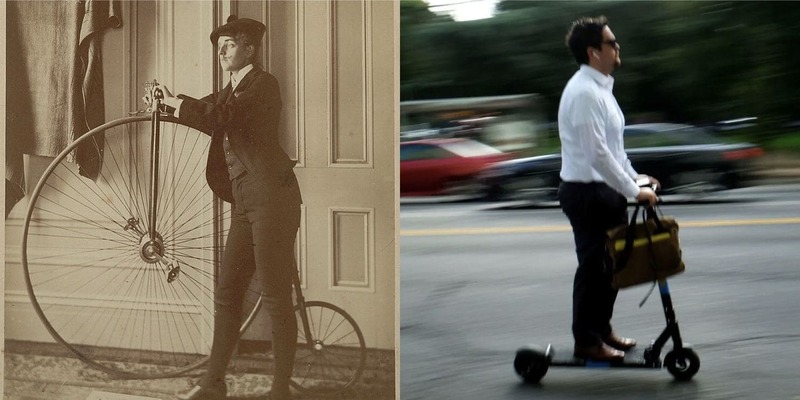 Quiz: Are these writers complaining about modern- day scooters, or 19th century velocipedes? It seems the debate around active transportation is a timeless one. Test your knowledge on “two wheeled menaces” and see if you can determine if the complaint was made 1 or 100 years ago! Take the quiz here!